The normal population of Queensland, according to the most recent official figures is just over 1,000,000. 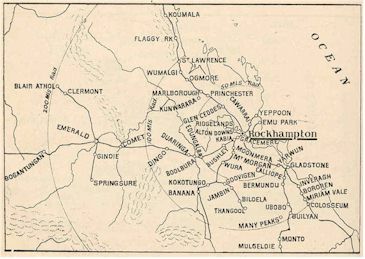 4BC is a station particularly easy to hear throughout the metropolitan area of Brisbane; 4GR Toowoomba provides entertainment for an enormous number of listeners throughout the Darling Downs and beyond; 4MB Maryborough is welcomed by listeners in thousands of homes of the Lower North Coast districts; 4RO Rockhampton is the only commercial station serving one tremendous area of Central Queensland, while 4SB Kingaroy, with its 2000 watts of transmitting power, is heard throughout the length and breadth of the State and far beyond. Those who want the best in programme entertainment in Queensland find just what they are looking for in the Five Stations of the QUEENSLAND NETWORK. 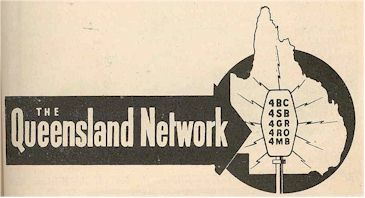 4BC Brisbane has the distinction of being one of the few commercial broadcasting stations in Australia whose programmes are heard clearly for many hundreds of miles. In Brisbane itself (where it's "4BC First"), no station is more easily heard throughout the metropolitan area; while listeners hundreds of miles away receive the great 4BC programmes on relay through the powerful 2000-watt station 4SB at Kingaroy. 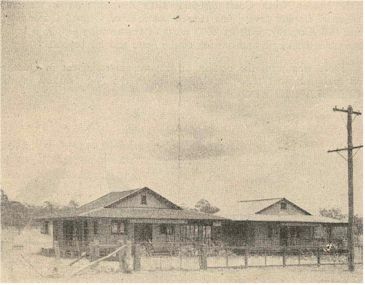 4BC Transmission centre at Indooroopilly on the bank of the Brisbane River, 200 ft. vertical mast in background. Queensland listeners know that for the very best in radio entertainment - for drama, serials, music and sport, they always can look to 4BC/4SB. 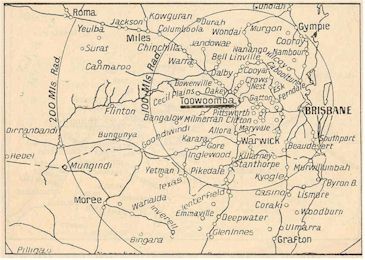 4GR Toowoomba, on proved performance over more than 20 years, is one of the great commercial broadcasting stations of Queensland. 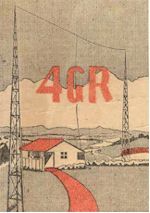 Operating from the centre of the Darling Downs, with an excellence of transmission which consistently reaches listeners clearly 200 miles away and more, 4GR is an institution throughout Southern Queensland and Northern New South Wales. 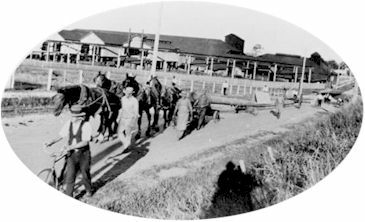 Since the opening of the station in 1925, 4GR always has been a centre of community life of the Darling Downs. Every local movement for the good of the community has received the energetic support of 4GR; many important local functions have been broadcast on the spot by the station's leading personalities; and 4GR, over the years, has become part and parcel of the life of the Darling Downs. An entertainment programme which includes many of the great national features on the air attracts and holds the loyalty of a very extensive audience, and 4GR has become a listening habit in the daily lives of its people. Station 4RO Rockhampton occupies a commanding situation in Australian commercial broadcasting, because it is the only commercial station in one tremendous area of Central Queensland. The nearest other transmitter is 150 miles away. This is 4RO-land; the great area of Central Queensland, where 4RO is a welcomed guiest in thousands of homes. That fact in itself has attracted to 4RO almost every important commercial broadcast programme on the air. 4RO listeners, over an area reaching far inland from the coast, enjoy an entertainment-packed programme not excelled by any other station in Australia, and including the very cream of all the best programmes on the capital city stations. From morning till night, the 4RO programme caters for every taste - for the housewife, the farmer, the mine worker, the city man, and the sportsman. Over a great area 4RO is the social force which is truly "The Voice of Central Queensland." 4MB Maryborough is a fine station, serving Maryborough, the "Newcastle'' of Queensland, and the rich agricultural district which surrounds it. 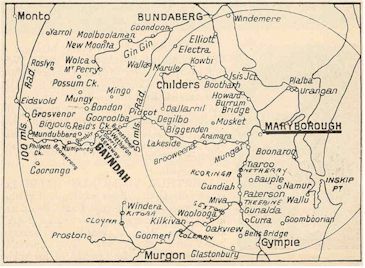 In the city of Maryborough itself, 16,000 people live within a radius of three miles, while there is a population of approximately 50,000 people within 50 miles. The area served by 4MB. To meet the varying needs of that audience - factory worker, city dweller and farmer alike - 4MB provides one of the most comprehensive entertainment programmes on the air, ranging from expert advice for the Man on the Land to outstanding musical and dramatic features of universal appeal. The programme is shaped to meet the mood of each hour, with romantic serials and music during the daytime, for the housewife at home; special late afternoon broadcasts for children; and an evening programme packed with the entertainment which 4MB listeners want. © Maryborough Wide Bay & Burnett Historical Society. In the world of sport, too, 4MB caters completely for those who want up-to-the-minute news and results. Five Great Voices in One,'Broadcast Year Book and Radio Listeners' Annual of Australia 1946-47.